I don’t know about you, but there came a point in my life where I had completely forgotten that having a tooth fall out was a thing. Cut to my first year teaching kindergarten, when I was reminded (and horrified) twenty times a day about this important stage of life. While every once in a while a tooth does come out, most conversations re: teeth in Kindergarten revolve around who has wiggly teeth, who has lost a tooth already, asking small children to please take their fingers out of their mouths, and the legitimate fearfulness a child has when her tooth is actually on its way out. I’ll be honest, this is not my favorite part of working with this age group. I am squeamish around blood and bodily fluids. But, I also realize that this is a big right of passage for my kiddos, and that they are often as nervous about blood and pain as I am. So I put on my best “good for you” face, and help them to look forward to losing teeth. Here are two practical additions to the classroom that make the lost tooth experience easy peasy. I admittedly stole the idea from genius teachers who flooded Pinterest with similar posters. 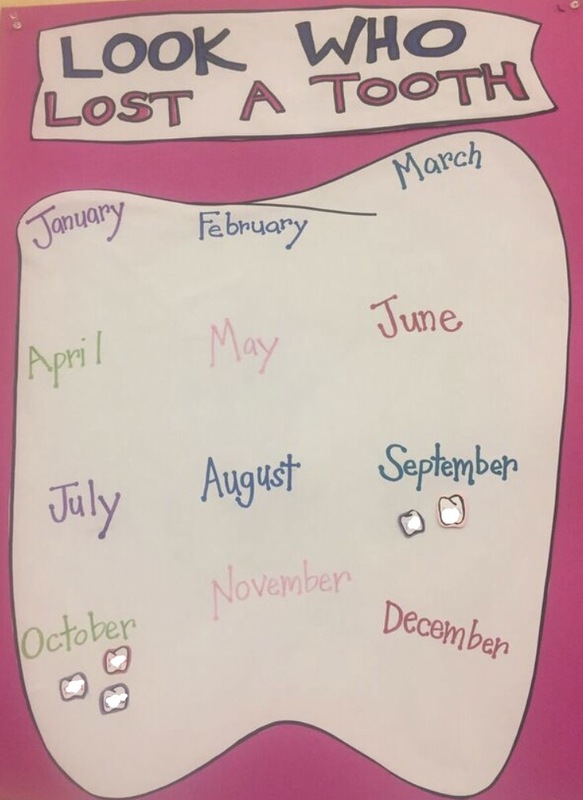 The Look Who Lost A Tooth Chart gives kiddos something to look forward to at school when they lose a tooth. While the Tooth Fairy is exciting at home, this is a way for Kindergarteners to celebrate with their friends. This is especially helpful in distracting little ones from anxiety over a tooth coming out. “You could be the first one on our tooth chart for this month!” seems to be enough to switch terror to excitement. The chart is also useful in reinforcing so many Kindergarten standards. I organized my chart by month to give the kids more practice noticing the names of different months and their order. It’s also an easy way to discuss “More or Less.” “Did we have more teeth lost in September or October?” The possibilities are endless. Run wild. 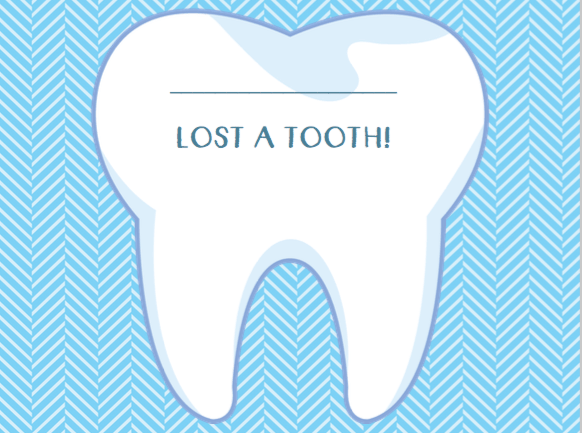 You only need to have one child lose their tooth somewhere in your classroom (literally… it was last seen near the blocks….) to teach you that you need a system to prevent that from ever happening again. I tape the tooth directly onto the tooth certificate, which makes that tooth nearly impossible to misplace. The paper is big and bright, meant to stand out when the child inevitably takes her tooth out of her backpack to show it off. No more worries about that tooth not making it home to be handed over to the tooth fairy. 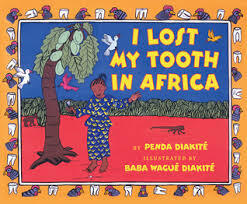 If you are looking to incorporate a couple of read-alouds to bolster your classroom teeth curriculum, check out I Lost My Tooth In Africa and Throw Your Tooth on the Roof. 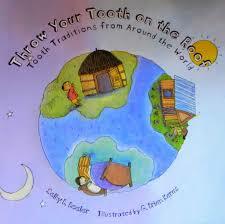 Each offers multicultural perspectives on tooth traditions. So, friends, those teeth are coming out whether you are ready or not. So get ready for them to be placed directly into your bare hands without any warning. Practice your best “I’m so excited for you” smile, stock up on hand sanitizer, and use some of these hints to make the event more manageable.